Although it's nothing new (we wrote about it way back in 2003!) it's rather surprising that this is the first time the Knee Defender has made headlines. It's almost too simple to be called a gadget: A pair of plastic braces—which cost only $21.95—are inserted on the passenger's tray table arms to prevent the seat in front of them from moving backwards. 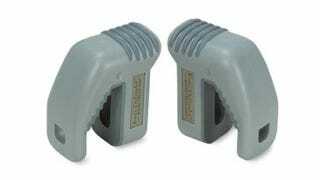 Airlines spoke out against the Knee Defender when it came out, but the FAA said they did not violate any specific rules. It even pretends to be polite: It comes with little courtesy cards you can print out and hand to the passenger in front of you to explain why their seat reclining feature is temporarily disabled.